Is Your Web Browser Safe? During this last year — my first as president/CEO of our certifying organization — I have invited and welcomed your letters and emails. Many of you reached out with encouragement for me and praise for NCCPA, and I can’t tell you how much I appreciated that. Others have helped to broaden my perspective on the wide ranging challenges facing PAs in practice in the many settings and specialties of health care and those facing PAs in each stage of the career lifecycle. Amidst it all, the most pronounced recurrent theme has been the relevance and difficulty of PANRE. My purpose in writing today is simply to say: we hear you. Later this fall, our Board will undertake an intensive review of the purpose, format and content of PANRE, drawing on all we know about the current state of PA practice (based on the Practice Analysis Survey several thousand of you completed for us earlier this year). We will consider and weigh many factors: the needs and expectations of the patients we serve and the other stakeholders who rely on certification as an indicator of competence; the diverse role of the PA in primary care and the many specialties and subspecialties of medicine and surgery in which they practice; PAs’ desire to be tested on content relevant to our current role as well as the importance of protecting our flexibility to change specialties; the range of potential assessment methods and their relative cost and accessibility; and certification accreditation standards and best practices in assessment. I have no idea what the outcome of all of that study and discussion will be, but I broadcast it now in the spirit of collegiality and transparency. Thank you again to those who took the time to complete the Practice Analysis Survey; that time and effort will be integral to these deliberations. To all, we will update you on the outcome of these important discussions before the end of the year. In the meantime, I know many of you will want to weigh in on this topic, and we welcome that feedback. Next month we will invite you to participate in a survey on the subject of PANRE. Watch this space for more on that in the next issue of NCCPA News. With several high profile data security breaches in the news in recent months, we thought you would appreciate knowing that NCCPA is taking new measures to ensure your information with us is more secure than ever. NCCPA adheres to standards established by the PCI Security Standards Councilto protect the transmission of credit card information. PCI suggests that to ensure the safest encryption possible, only the most current versions of internet browsers should be used when making payments. That new PCI standard goes into effect June 30, 2016.
information and instructions on what to do next. We encourage you to perform this check from all devices you use to access our website before next year so you don’t find yourself unable to sign in at a time when you might have requirements due to maintain your certification. Earlier this year we instituted new, more secure measures for you to sign in to your record and to retrieve your user ID and/or password, eliminating use of social security numbers as a regular log-in option. The security and confidentiality of your personal information is of utmost importance to us. We hope you understand and appreciate the measures we are taking to protect it. Because NCCPA wants employers, physicians and the public to be aware that certified PAs are highly capable healthcare providers who perform extensive medical services and intricate procedures, we are launching a campaign called “PAs Do That!”. We have a dedicated web page and will be advertising in healthcare media. Read about seven of your colleagues who represent certified PAs well. This first ad in Modern Healthcare begins Aug. 24 in conjunction with their cover story on the "100 Most Influential People in Healthcare". Our ad will link to the “PAs Do That!” website. The Boards of NCCPA and the nccPA Health Foundation took time out during a recent meeting to pack 144 backpacks with school supplies. 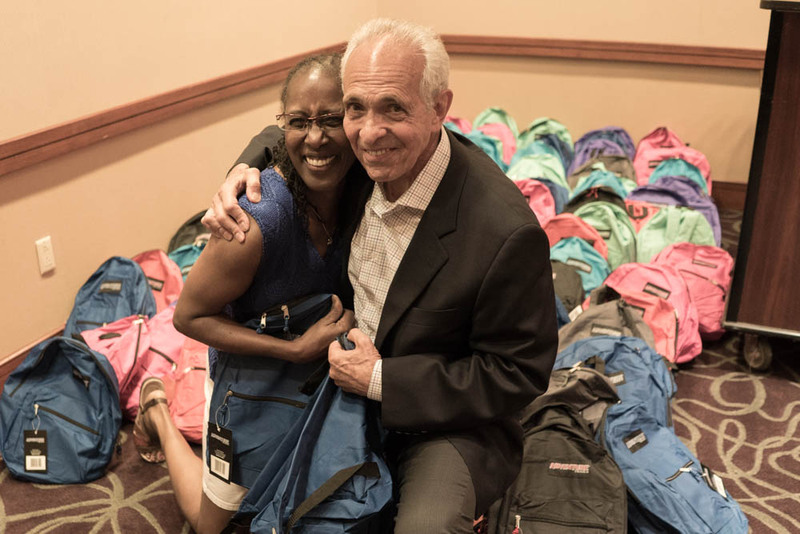 NCCPA Board member Robin Hunter Buskey, PA-C poses with Joe Lagana, Ed.D., founder of the Homeless Children's Education Fund, the Pittsburgh-area charity that will distribute the backpacks. Dr. Lagana is a former member of the NCCPA Board, chair emeritus of the Foundation, and a real champion for the PA profession. Be a part of your profession’s history by serving on the PA History Society Board of Trustees! The Society is now accepting applications for these voluntary board positions to serve a three year term (January 1, 2016 thru December 31, 2018). Applications will be accepted through September 1, 2015. The PAHx Nominating Committee will review all applications and conduct telephone interviews with the finalists in September. PAHx Trustees are expected to provide leadership and vision for the organization and have a fiduciary responsibility to the organization. The Trustees should have a genuine interest in the work and mission of the organization. The Society’s Board is considered a ”working board.” As such, Trustees are expected to complete a variety of tasks annually such as: write 3 – 5 biographies (visit http://www.pahx.org/bio.html for samples); write short articles for the quarterly newsletter; participate on 1 – 2 PAHx committees; participate on a New Board Member Conference Call; and actively participate during the Society’s bi-annual Board meetings (April & November), which are generally held in the Atlanta area. The Society covers the hotel and travel expenses for Trustees to attend the two board meetings. For additional information, please email LoriK@nccpa.net, and your questions and/or applications will be forwarded to the PAHx Nominating Committee Chair, Gloria Stewart, Ed.D., PA.
History is always being made... find out more by visiting the PA History's website for the latest features and new exhibits throughout the site. If you haven't already done so, be sure to "like" PA History on Facebook to receive updates, and to try your hand with PA history trivia! In early August, the nccPA Health Foundation announced new strategic initiatives to advance the role of certified PAs to improve health while promoting the profession, benefiting patients, and fostering collaborations with partners. “We believe passionately that certified PAs are change agents who advance the health of patients, and the Foundation’s new body of work seeks to exert leadership in the thoughtful consideration of emerging health care trends and the development of impactful strategies, with PAs at the center of our work,” said Cynthia B. Lord, MHS, PA-C, chair of the Foundation Board. In addition to convening PAs and other thought leaders around issues of strategic importance, the Foundation will also continue to promote oral health, raise awareness about opportunities to integrate mental health and wellness more fully in PA practice, and launch a performance improvement initiative. The Foundation’s new initiatives will be further developed in the coming months; check back in the NCCPA News for more information. Are you passionate about health and the critical role of PAs to shape a healthier future? Then, you’re invited to apply for one of the three seats coming available on the Foundation Board in 2016. Board members will shape the organization’s newly-identified body of work while providing strategic and fiduciary oversight and working to ensure organizational sustainability. The Foundation will review all candidates and may conduct telephone interviews with finalists. The new directors will be elected by the NCCPA in February 2016 and begin their service to the Foundation immediately. Prospective candidates are advised that the first term extends through December 31, 2018, with the possibility of reelection for a second three-year term. Interested candidates are invited to learn more by reviewing our Information for Prospective Candidates and to submit their materials to Tiffany Flick (tiffanyf@nccpa.net) by Friday, September 18, 2015. At NCCPA, we work to promote the role, impact and qualifications of PAs in many ways including through the media. Here are some recent results of those efforts and other notable mentions of NCCPA and PA certification in the news. Meeting the Challenge of Patient Engagement is the cover story of HealthLeaders this month. The article includes quotes from Dawn Morton-Rias, Ed.D., PA-C, NCCPA president and CEO, and Dr. Thomas Bat, founder of North Atlanta Primary Care, about how PAs can make a big difference in patient engagement and satisfaction. The Hospitalist, a publication of the Society of Hospital Medicine, interviewed Ed Lopez, PA-C. Read “Post-Acute Patient Care Offers Opportunities for Non-Physicians” or listen to a 10 minute audio clip of Ed describing how PAs helped reduce hospital readmissions from 35% to 7%. Brian Maurer, PA-C, blogs this month in Physicians Practice about how Certified PAs Grow Practices and Get Patients Back to School. International media is taking note of how NCCPA certifies PAs. Read an interview of Dawn Morton-Rias, Ed.D., PA-C by a journalist with the The Medical Independent in Dublin, Ireland. Fred Wu, PA-C, and Secretary/Treasurer of the Society of Emergency Medicine Physician Assistants (SEMPA), was featured this month in Emergency Physicians Monthly on PA Training and Supervision and Myths vs Facts: The Truth Behind PA Misconceptions. Ready to make a difference in your community? Let the nccPA Health Foundation help you promote your profession by equipping you with funding for a community outreach project that embraces oral health as the low hanging fruit of prevention. Learn more about our $500 grants program online.